value from the growing masses of structured and unstructured data, when traditional platforms lack flexibility and demand significant capital expenditure. 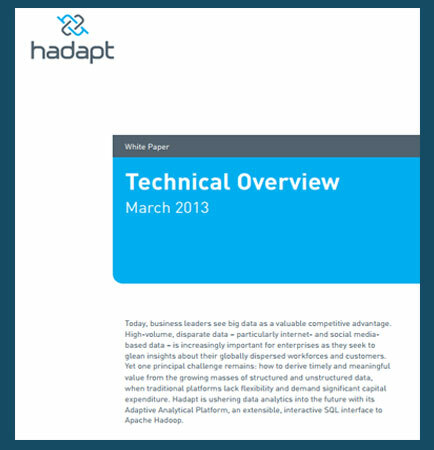 Hadapt is ushering data analytics into the future with its Adaptive Analytical Platform, an extensible, interactive SQL interface to Apache Hadoop. While most businesses are heavily invested in effective, well-established data warehouses, operational data stores, data marts, and business intelligence tools to mine and analyze structured data, many still do not have a clear approach for analyzing unstructured and semi-structured data such as audio, clickstreams, graphics, log files, raw text, social media messages, and video. Organizations understand that legacy relational database approaches are neither cost-effective nor efficient for unlocking the wealth of information in unstructured data. Yet companies continue to devote the majority of their resources to managing the smallest portion of their data (structured), while moving the majority of their data (unstructured) into special-purpose databases or content management systems with little or no analytic capabilities.